Science fiction is thriving; only today it’s all being written by global warming enthusiasts. I’ve used the phrase “global warming enthusiast” in numerous blog posts and in many more comments around the blogosphere since I found that Clarkson article. Occasionally, someone will respond to it with something to the effect of No one is enthusiastic about anthropogenic global warming. Bad things will happen because of it. That always sounded like more science fiction to me. Global warming is about to get a boost. As this year’s El Niño sets in, early signs are pointing toward the possibility of a rare occurrence: back-to-back El Niño years. If it happens, it would virtually guarantee a new global heat record in 2015 and could help usher in a decade or more of accelerated warming. The author sounds awfully enthusiastic about the thought of “a decade or more of accelerated warming.” The only thing missing is an exclamation like Yippee! But the author’s enthusiasm is overshadowed by his misunderstandings, conjectures and blatant errors. But good things can come from them. People who want to learn can learn, and those who don’t won’t. 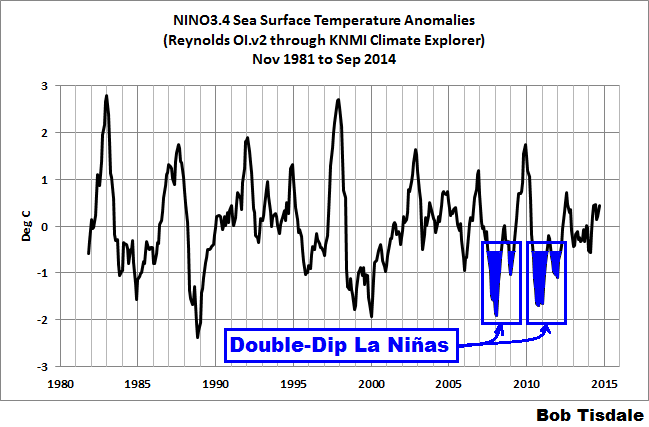 The title of the article is very strange: “An El Niño Double-Dip?” Sorry. The phrase double-dip was applied to the La Niña events of 2007/08 and 2008/09 and the La Niña events of 2010/11 and 2011/12 because there were back-to-back dips (cooling) in the sea surface temperatures of the eastern equatorial Pacific, separated by off-season ENSO-neutral conditions. See Figure 1. 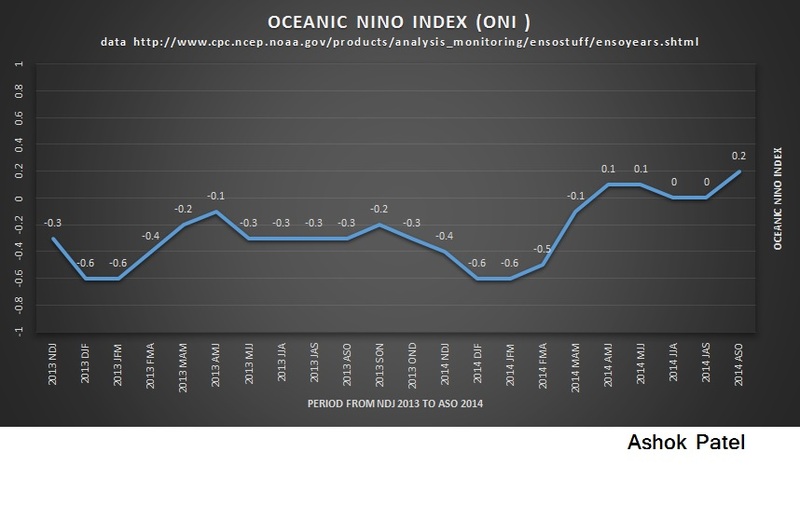 Or if you’d prefer data presented in tables, see the annotated screen cap of the NOAA Oceanic NINO Index (ONI) in Figure 2. Double-dip would not apply to back-to-back El Niños separated by ENSO-neutral conditions, because those would be rises in the sea surface temperatures of the equatorial Pacific. If someone’s looking for alliteration, they could try repeated-rise El Niños, not double-dip. I’m not being pedantic about the difference between multiyear and back-to-back El Niño events. El Niño events are tied to the seasonal cycle, also known as phase locking, and as a result they normally peak in boreal winter and decay into boreal spring. See the post Why Do El Niño and La Niña Events Peak in Boreal Winter? An El Niño that does not decay in boreal spring, but lasts through to a second season, defies the seasonality of El Niños. To further compound the oddness of the headline, the author uses as a reference the NOAA CFSv2 modeled sea surface temperature anomaly forecasts for the NINO3.4 region of the equatorial Pacific, dated October 14, 2014. See Figure 3. The mean of the forecast (dashed black curve) remains elevated, above the El Niño threshold of 0.5 deg C, through May-June-July, which is the ENSO off-season. What’s missing? The return to ENSO neutral conditions in the off-season. It’s absence would suggest a multiyear El Niño, not a back-to-back one. A spring ‘predictability barrier’ exists in both data and models of the El Niño/Southern Oscillation (ENSO) phenomenon. In statistical analyses this barrier manifests itself as a drop-off in monthly persistence (lagged correlation) while in coupled ocean-atmosphere models it appears as a decrease in forecast skill. The ‘persistence barrier’ for ENSO indices is investigated using historical sea surface temperature and sea level pressure data. Simple statistical models are used to show that the persistence barrier occurs because the boreal spring is the transition time from one climate state to another, when the ‘signal-to-noise’ of the system is lowest and the system is most susceptible to perturbations. The strength of the persistence barrier is shown to depend on the degree of phase locking of the ENSO to the annual cycle. References to the “spring predictability barrier” can be found in papers from the early 1990s, and the barrier still exists for forecasters. Bottom line: ENSO forecasts are notoriously unreliable through boreal springtime. Q: Are back-to-back El Niño events possible, with ENSO-neutral conditions separating them? A: Yes, according to NOAA Oceanic NINO Index (ONI), a pair occurred in 1957/58 and 1958/59 and another pair happened in 1976/77 and 1977/78. Q: Are multiyear El Niño events possible, without a return to ENSO-neutral conditions during what would normally be considered the ENSO off-season? A: Yup, the 1986/87/88 and 1969/70/71 El Niño events are examples. 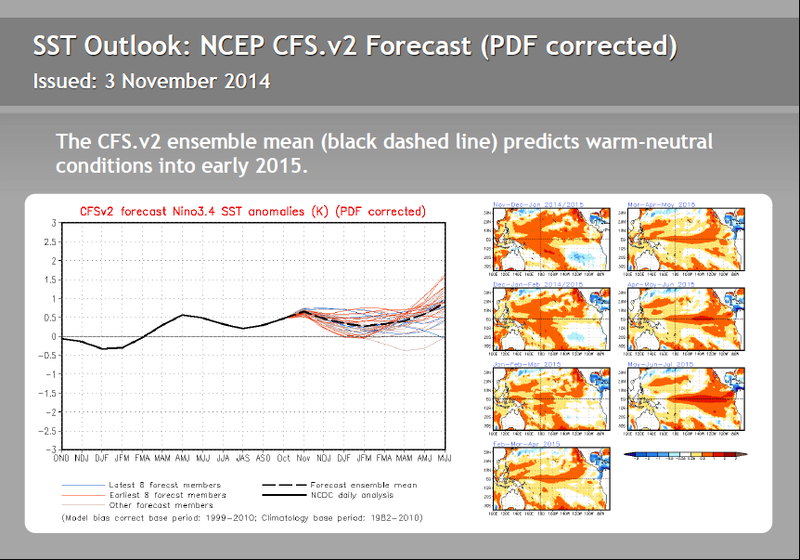 Q: Has the NOAA CFSv2 model shown any skill at predicting back-to-back or multiyear El Niños? Nope, sadly it’s too new to have a track record. The NCEP Climate Forecast System Version 2 (CFSv2), according to the linked webpage, “became operational at NCEP in March 2011.” And according to the NOAA Oceanic NINO Index (ONI), there have been no El Niño events, of any kind, since the CFSv2 became operational. Even if there’s not a second El Niño, a longer-term climate signal is beginning to point in the direction of more frequent bursts of warming over the next several years. Over the next few years, a natural climate oscillation known as the Pacific Decadal Oscillation (PDO) is poised to kick into gear. Historical data has linked the “warm” phase of the PDO with a 15- to 30-year temporary surge in global temperatures. A new paper even shows this sort of natural variability could trump long-term human-caused climate warming in localized areas like the Pacific Northwest. The PDO can be thought of as the atmospheric manifestation of a stretch of frequent El Niño events. If El Niño is the spark that ignites a months-long transfer of heat between the ocean and the atmosphere, the PDO is an indicator of how much fuel is in the gas tank. The author of the Slate post clearly has no idea what the PDO is all about. We recently discussed the Pacific Decadal Oscillation in minute detail in the post The 2014/15 El Niño – Part 5 – The Relationship Between the PDO and ENSO. The PDO Index is a numerical representation of the spatial pattern in the sea surface temperature anomalies of the extratropical North Pacific (northward of 20N), where a positive PDO spatial pattern has warmer sea surface temperature anomalies in the eastern extratropical North Pacific (along the coast of North America) than in the central and western North Pacific (the Kuroshio-Oyashio Extension). That spatial pattern is typically created by strong El Niño events. A positive PDO index value basically represents how closely the spatial pattern of the sea surface temperature anomalies of the extratropical North Pacific matches those created by strong El Niños. The higher the number, the closer the match. Conversely, a negative PDO Index value relates to the pattern created by La Niñas. The PDO Index values have different variations in time than those of an ENSO index (like NINO3.4 sea surface temperature anomalies) because the spatial patterns in the surface temperatures of the North Pacific are also impacted by the sea level pressures (and related wind patterns) there. Contrary to the mistaken beliefs of the author of the Slate post, the PDO cannot “be thought of as the atmospheric manifestation of a stretch of frequent El Niño events”. The PDO index is derived from sea surface temperatures. And the PDO is definitely not “an indicator of how much fuel is in the gas tank…” for El Niños. For that one must refer to the ocean heat content data for the tropical Pacific. 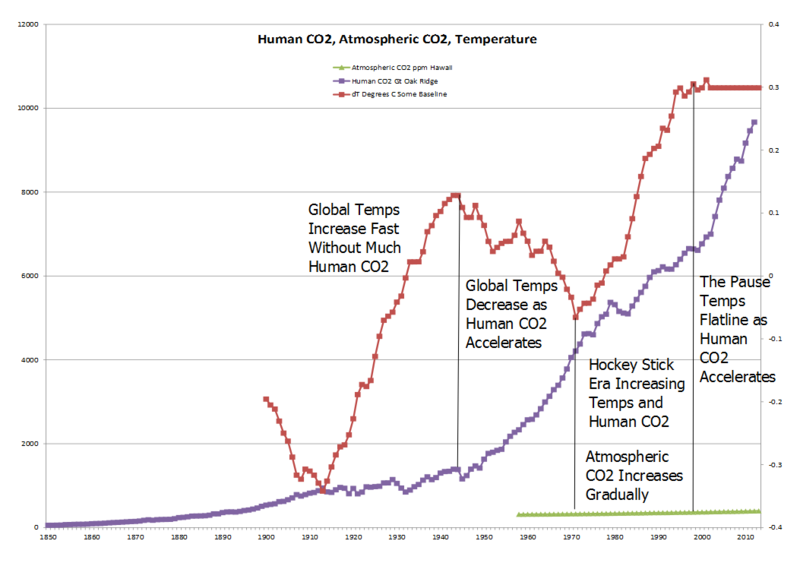 See Figure 4, which is from the post The 2014/15 El Niño – Part 2 – The Alarmist Misinformation (BS) Begins. Sorry to disappoint the author of the Slate post, but the warm water available for El Niños has dropped in recent years. And the author of the Slate post gets something kind-of right, but obviously has no grasp of reality (my boldface). Even if there’s not a second El Niño, a longer-term climate signal is beginning to point in the direction of more frequent bursts of warming over the next several years. Over the next few years, a natural climate oscillation known as the Pacific Decadal Oscillation (PDO) is poised to kick into gear. Historical data has linked the “warm” phase of the PDO with a 15- to 30-year temporary surge in global temperatures. It’s very odd that a global warming enthusiast would parrot something that skeptics pointed out about a decade and a half ago. Unfortunately, there is no mechanism through which the PDO (as represented by the JISAO definition of the PDO) can cause global surface temperatures to warm. The PDO index is actually inversely related to the sea surface temperatures of the region from which it’s derived. The processes that cause the PDO are the same processes that cause natural (sunlight-fueled) global warming or suppress it, and those processes are the ones associated with El Niño and La Niña events. In the past I’ve written: The strength of ENSO phases, along with how often they happen and how long they persist, determine how much heat is released by the tropical Pacific into the atmosphere and how much warm water is transported by ocean currents from the tropics toward the poles. During a multidecadal period when El Niño events dominate (a period when El Niño events are stronger, when they occur more often and when they last longer than La Niña events), more heat than normal is released from the tropical Pacific to the atmosphere and more warm water than normal is transported by ocean currents into adjacent ocean basins and toward the poles—with that warm water releasing heat to the atmosphere along the way. As a result, global sea surface and land surface air temperatures warm during multidecadal periods when El Niño events dominate. They have to. There’s no way they cannot warm. Maybe it’s easier to think of the long-term impact of ENSO another way. During multidecadal periods when El Niño events dominate, atmospheric and ocean circulation become hyperactive, leading to a long-term, naturally caused, sunlight-fueled global warming. Also, during multidecadal periods when La Niña and El Niño events are more evenly matched, as they have been for the past decade, atmospheric and ocean circulation become more balanced, leading to the cessation of the long-term, naturally caused, sunlight-fueled global warming. 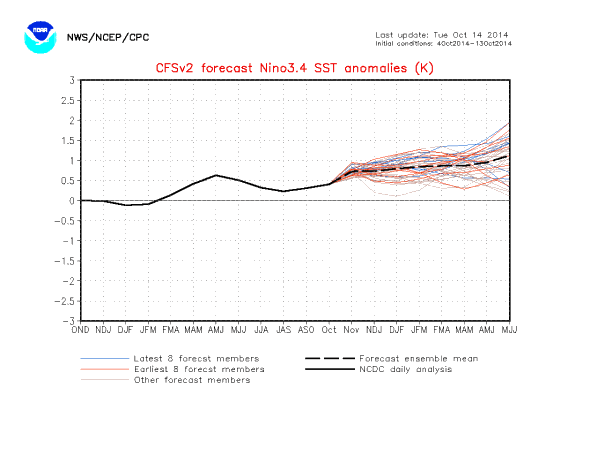 Focusing on the mean again, the most recent forecast for NINO3.4 sea surface temperature anomalies from the NCEP CFSv2 model, Figure 5, shows a decline in the temperatures there over the next few months, meaning no El Niño this season, which would mean no back-to-back El Niños and no multiyear El Niño. See the NOAA Weekly ENSO Update (page 26). This entry was posted in 2014-15 El Nino Series, El Nino-La Nina Processes. Bookmark the permalink. Thanks Bob. They obviously think that wishing and hoping for an El Nino will make it happen. Jokers. As always, clear concise and readable by those who want to learn. Thanks. By the way, I always read your posts here and usually again at WUWT. Reading it again there aids my slow comprehension and the replies you give to questions help a lot. Bob, just want to point out that the 57-59 back to back or whatever was right in the middle of the 1945 to 1976 cooling and in fact that cooling period is interrupted by a significant warming spike in the middle. This is a very mild and declining El Niño event. Most of the agencies monitoring El Nino have been forecasting every month from the beginning of 2014 that an El Nino would begin in the next two months. Nothing has materialized as yet and we have completed 10 months of 2014 with no month having ONI index of +0.5. El Niño: characterized by a positive ONI greater than or equal to +0.5ºC. La Niña: characterized by a negative ONI less than or equal to -0.5ºC. PS: An afterthought…It’s interesting to watch things change in the real world and in the forecasts. Most of the agencies monitoring El Nino have been forecasting every month from the beginning of 2014 that an El Nino would begin in the next two months. Nothing has materialized as yet and we have completed 10 months of 2014 with no month having ONI index equaling or exceeding +0.5. While it uses your phrasing of discharge/recharge, you will find some differences. But nonetheless, it reminds me of your theories. Oops. I meant to put quotes around the abstract. Hi Pamela, thanks for the link. I added the quotes for you to your first comment. A very simple description of the Jin recharge-discharge oscillator is that some of the warm water released by an El Nino is distributed poleward (the discharge phase). After a period of time, some of that warm water returns to the equatorial Pacific (the recharge phase). With surface circulation in the Pacific as it is, along with shallow meridional overturning circulation, the Jin recharge-discharge makes a lot of sense. In fact, I suspect the series of El Ninos after the 1997/98 El Nino (the ones in 2002/03 and 2004/05 and possibly 2006/07) were secondary events caused by some of the “leftovers” from the large event returning to the equatorial Pacific. I’ve avoided discussing the Jin recharge-discharge oscillator because people would likely confuse it with the Trenberth recharge-discharge oscillator, which is what I’ve been documenting and clarifying for the past 6 years. Thanks for linking it. Maybe I need to write a post about the two. Please do! I have learned a lot from you over the years and need a bit of remedial lessons on the difference between Jin and Trenberth. It would be a fascinating post and timely given the current interest in this little red engine “I think I can” El Nino. And now back to football (yeh I’m a rabid fan).